Tokyo Gov. 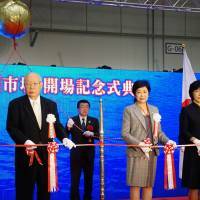 Yuriko Koike said Thursday she hopes the new wholesale food market in the Toyosu district of Tokyo’s Koto Ward will become a “center” of food culture. The Tokyo Metropolitan Government will open the Toyosu market, which will succeed the iconic but aging Tsukiji market in Chuo Ward, on Oct. 11. 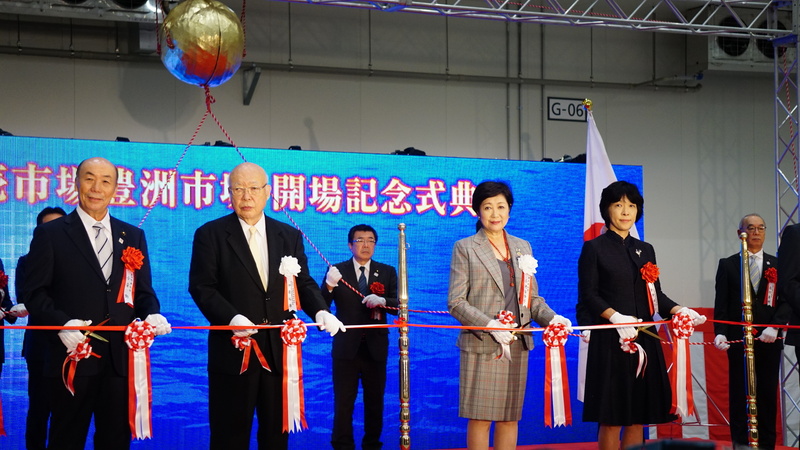 “We hope to nurture (the Toyosu market) into a new center showcasing food culture that will bring vibrancy to the local community,” Koike told a ceremony to celebrate the launch of the new market, held at the Toyosu site. The new market, featuring cutting-edge equipment, sits on an area of 400,000 sq. meters, 1.7 times that of the Tsukiji market. It will be the largest central wholesale market that handles fishery products in Japan. While the Tsukiji market had many hygiene problems as it is not enclosed by walls, the Toyosu market is not exposed to outdoor air, making it easier to manage temperatures for refrigerated and frozen products. With better logistics functions, the Toyosu market is expected to increase the amount of fishery products it handles by 1.6 times from the current level at Tsukiji to some 620,000 tons in five years. The market relocation comes about two years later than previously scheduled, due to additional safety work to control soil pollution at the Toyosu site, where a gas plant used to stand. But locals are concerned about persisting negative views stemming from the soil pollution problem and about traffic congestion around the new market. With a planned tourist facility within the compound of the Toyosu market expected to open in spring 2023, there remain challenges to creating a vibrant new market as requested by the Koto Ward government and others. The metropolitan government will promote tailgate sales of food and beverages and set up temporary restaurants as provisional measures. But it is uncertain whether the planned facility at Toyosu will become a famous tourist spot like the Tsukiji outer market, the popular shopping area next to the Tsukiji market. Meanwhile, the Tsukiji market will be dismantled after the relocation, putting an end to about 83 years of operations. The Tsukiji site will become a parking lot that will be used as a transport hub for athletes participating in the 2020 Tokyo Olympic and Paralympic Games. Part of the site will also be used for Ring Road No. 2, which will connect the capital’s central and waterfront areas. The metropolitan government plans to redevelop the Tsukiji and waterfront areas in 2020 or later.